This year’s Regent Street Christmas lights in London were transported in Schmitz Cargobull trailers after a new order from Southern Van Lines, a company also responsible for festive displays in the City of London and towns across the Home Counties. The two new box trailers are now in service delivering lighting, sound and set equipment for theatre, pantomimes and event companies in the UK and across Europe. The trailers have an integrated loading ramp built into the back, which makes it safer and easier to unload heavy and time-critical deliveries. Director Charles Colley, says: “Nearly every company in our sector uses Schmitz Cargobull trailers and they all rave about the build quality. They’re perfect for everything we do from moving heavy sound systems to delicate lights or stage props. Constructed on a bolted chassis for extra strength and durability, the new arrivals join a 40-strong fleet and will remain in service for at least 15 years, clocking up 100,000 km annually. 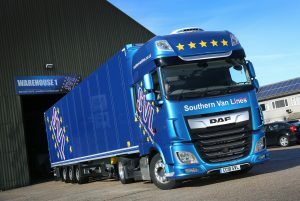 Southern Van Lines has been providing transportation and logistics services to the entertainment industry for more than 25 years. Based in Belvedere, Kent, its portfolio of work also includes concerts, exhibitions and festivals.